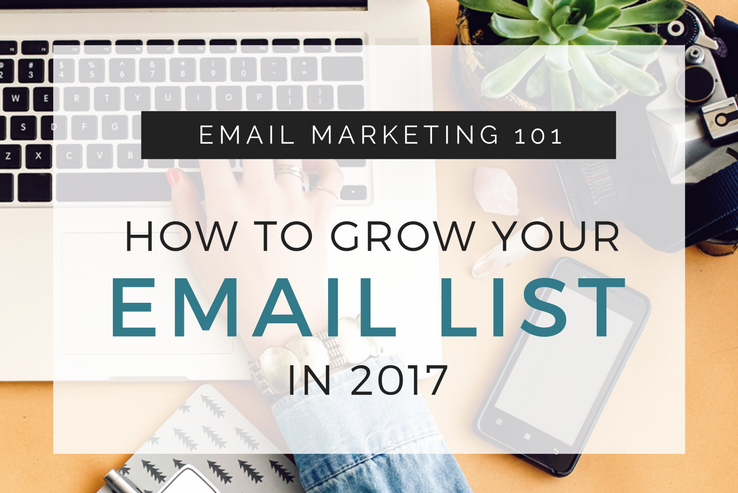 How do you grow your email list? Especially when you’re starting from scratch? Who Are You Trying To Attract? And Why? 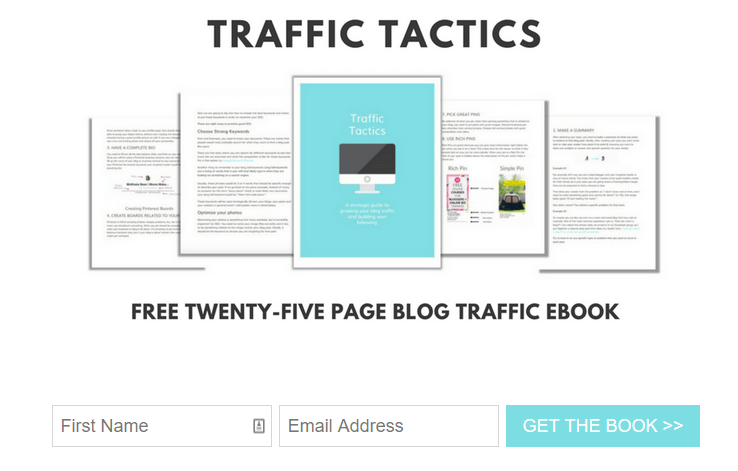 This might seem like a no-brainer, but you don’t want just anybody on your email list. You want fans who’ll read your emails, engage with your content and offers, and email you back. Keep the end goal in mind when you’re planning out your list building strategy. What do you want from your email subscribers? Do you have a product to sell them? Do you want them to visit your blog frequently and click on your ads? Do you want to nurture them in preparation for launching a course or product later? A mistake many new bloggers fall into is taking the advice to “list build” but not having a plan for their list after they get people onto it. If you fill your email list with the wrong subscribers and don’t do anything with them, you aren’t much better off than if you hadn’t started your list yet. Why should someone join your email list? What’s in it for them? The old “sign up to receive our newsletter updates” subscriber box in the sidebar is no longer enough. 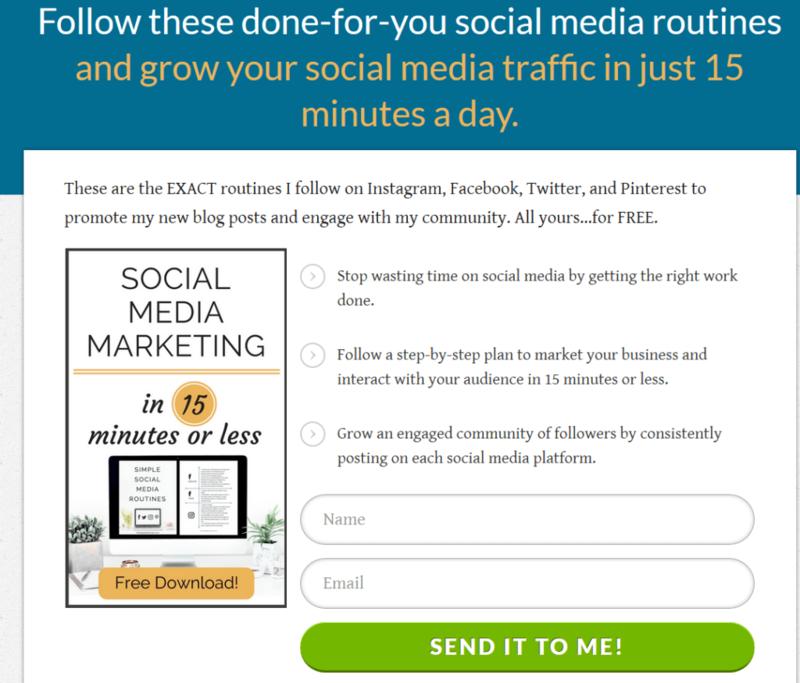 Want more email subscribers? What are you offering them? But, what can you offer people in exchange for their email? A content upgrade is a bonus piece of content that your readers can subscribe to get access to. It “upgrades” the content of a blog post that you’ve already written. Successful content upgrades are simple but useful. For example, Bryan Harris of Videofruit uses content upgrades frequently. 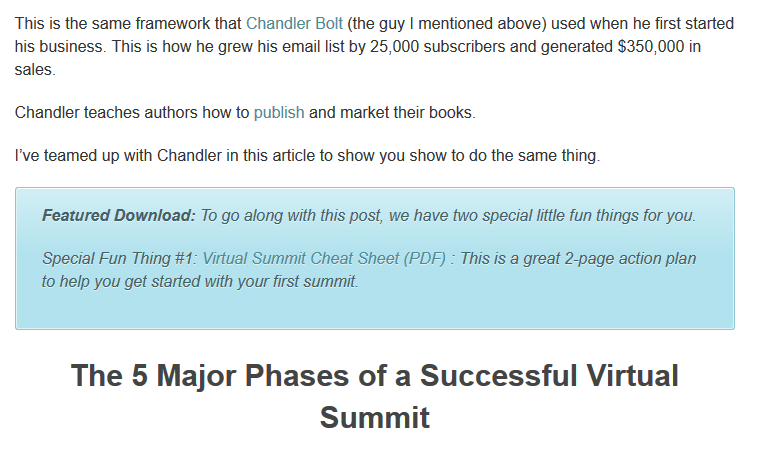 In his post, Virtual Summit Checklist = 25,000 Email Subscribers he offers a content upgrade – a cheat sheet on how to run a Virtual Summit. Since this post is all about how to successfully run a virtual summit, it’s a no-brainer for any reader to download the cheat sheet so they can reference it when it comes to planning their own summit. Why is this a great content upgrade? It’s small (2-pages) and easy to digest. It repurposes content that was already used to organize the summit. Highly targeted and relevant to the blog post. It’s a tool, rather than providing more information. In contrast, a lead magnet is something that is usually offered in the sidebar or header of your site. It’s generally niche-specific rather than post-specific. Why is this a great lead magnet? It’s valuable and attractive to the broader niche of bloggers. It hits on a pain point for most bloggers – why is no one reading my content? How can I get my blog post to go viral? It directly relates to his expertise – Jon Morrow is known as a great writer, so a cheat sheet relating to writing better blog posts is an instant winner for anyone who wants to learn from his success. The last thing we want to do is fill our email lists with subscribers who’re just there for the freebie and don’t care either way about us. And this can easily happen if we don’t target our incentives properly. A very popular incentive for bloggers is a list of Facebook groups with a schedule of the days that they allow promotions. I used it myself on my blog. However, I made a mistake aiming for quantity of groups for the list. As a result, I’ve had many people subscribe who aren’t my target audience but are just looking for a big list of Facebook groups to promote in. When I redo the list in the future, I’ll narrow the list down to Facebook groups that focus on the needs of my audience. In the sidebar, header, or footer of your site. In the content of your blog post, as text or an image. On a dedicated landing page. You can see how Jon Morrow uses his header to promote his opt-in and Bryan Harris promotes his content upgrade with a blue box in his content. Other bloggers, like McKinzie Bean of Moms Make Cents, use an image within their blog content to show readers what they’re getting if they subscribe. But, what about using a landing page? A landing page is a distraction-free page which gives your readers one simple choice – subscribe or leave. Conversion rates can be up to 50%. Why is this so high? Studies have shown that when presented with too many choices, people will often freeze and not make a choice. On an ordinary website page, there are so many actions your readers could take. Do they want to click on your About page? The latest post in your sidebar? Your social media feed widget? In contrast, a landing page has all unnecessary distractions removed. Once you arrive on this page, there’s no other option but to subscribe, close the browser or click back. There’s nothing to distract you, and the incentive you get for signing up is clearly displayed on the page. Emily even includes social proof in the form of testimonials at the bottom of the page to further help convince people to subscribe. Promote your landing page link in a social media post or Facebook share group. Include a link to your landing page in your social media bio. Link to your landing page when guest posting. There are many more ways to build your email list. Use a service like Vyper.io or a plugin like KingSumo where you can give your readers extra entries for social shares. This helps your giveaway go viral as people share more to get more entries. There’s a lot that goes into making a giveaway successful but, most importantly, make sure that your giveaway prize/s are targeted to your ideal audience. Generic prizes like cash or iPads won’t get you targeted subscribers. You don’t need to have a product to sell or a large email list to run a webinar. You can run a pitch-free webinar that is just about providing value to your audience by teaching them something new. Record the webinar and you can offer the replay as a content upgrade or lead magnet! If you already have people on your email list, you might be able to do a joint venture webinar with another entrepreneur. This is a great way to network with other bloggers and also expose your audience to important topics that you don’t have expertise in. Running a challenge is a great way to get people to sign up for your email list and engage with your content. Nathalie Lussier, founder of AmbitionAlly, has had over 15,000 people join her email list because of her free evergreen challenge, the “30 Day List Building Challenge.” During the 30 days of the challenge, participants receive emails, video tutorials, and have access to a free Facebook group to discuss the lessons. If you’re at the start of your email list-building journey, it can be hard to pinpoint exactly what your readers want to see from you. Use these examples, adapt them to suit your audience and test to see what works best for you. The most important thing is to stay targeted with your opt-in offers so you fill your email list with raving fans! Over to you – how are you building your email list? What are you struggling with?